I certainly have. In fact, I kinda do right now. Isn’t it sort of freeing to admit? Like I said…this is where I’m at and maybe some of you can relate. So, last week I sat down at my piano and picked a few chords and started playing. I was irritated and frustrated with my present state but I held all that in and started to sing things you’re “suppose” to say to God. These two questions melted me. It was as if God was asking me these questions, beckoning me to just be real. Why do I always say what I think He wants to hear when those Christian-ese things are the farthest from the truth of where I’m at? Now, there’s a balance of course. There is an awe and reverence I believe we need to have when it comes to how we relate to the Creator of the entire–well–everything. But does that mean we aren’t real with Him, too? No: the Bible says “pour your hearts out to him” (Psalm 62:8). I’m sure that means not just when things are going fabulous. It means pour out your hearts when things are great, but then when all hell breaks loose? Yeah, you got it: we pour our hearts out to him once again. How long will I wrestle with my thoughts and every day have sorrow in my heart? Look at me and answer, Oh Lord my God. But I will trust in your unfailing love; my heart rejoices in your salvation. 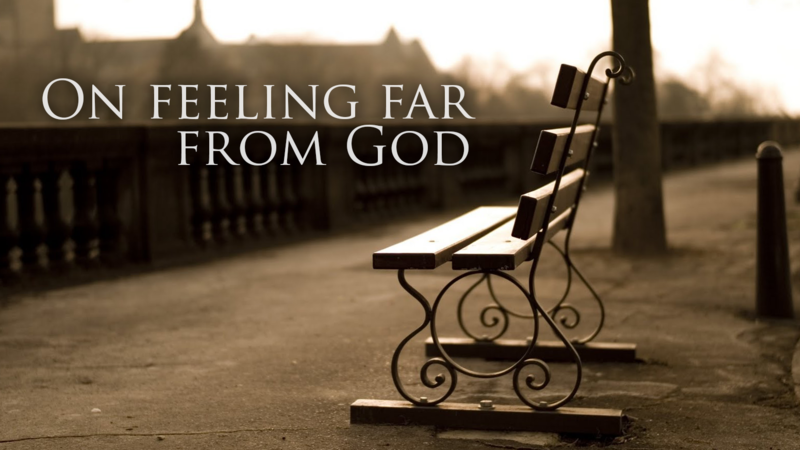 If you’ve ever felt far from God, you’re obviously in good company. In times of feeling this particular way, I have learned the best thing to do is to remember the things you already know to be true about who He is, kind of like what David did above. God is lots of things, but for me–in this season–I remind myself how FAITHFUL and PATIENT and CONSTANT and KIND He is. Regardless of how I feel or what the circumstances are, good or bad, these things WILL NEVER, EVER CHANGE. For David…well, that’s quite the situation he had going on. The beginning sounds pretty raw and honest and then in the end it is apparent he is reminding himself about God’s “unfailing love,” “salvation,” and goodness to him. In many ways, the same goes for our relationship with Jesus. In the past ten years of following Jesus I’ve learned something really, really valuable: It’s in these times…these feeling-far-from-God times…that what you do today, you will live in the fruit of tomorrow. What this means is: you just keep going. You keep talking and you keep asking and you keep worshiping and you keep being open and you keep being real with the One who knows you best…even when you don’t feel heard. When you feel as if you’re talking to a freaking wall. Yes, I believe distance from God can be caused by something we’ve intentionally put between Him and us. But sometimes it’s just a particular season we’re in and since I know He’s in it all and He’s faithful to never let anything go to waste, there’s something to be learned; a new facet of Him to be grasped in these not so fun times. So, I was asked those two questions: “What’s on your mind? How do you really feel?” jolting me out of a “just doing my duty” state of mind. I stopped singing nonsense, honestly answered back and a little song came out of it. What’s on your mind? How do you really feel? So can I just be clear on where I’m at today? After getting this song out, I didn’t necessarily feel all ooey, gooey close to God. I still felt far away. But after writing this song, I remembered again this is just a season and to God there is never wasted time. This season in my life is as important as (and maybe even more so) a “mountain top,” everything-is-awesome kind of season. I felt less like someone going through the motions and more like His kid again. I’m.His.kid. and like any good Dad, He really likes me and wants to hear what’s up, regardless of how it comes out. Once again, thanks for reading…and listening. This post really spoke to me. I am going through a similar season as often I feel disconnected from God. I know He’s always there and I can feel His hand over me, but yet I am frustrated and I find myself searching… The song you wrote is beautiful and it touched my heart. Thanks Brittany. I am looking forward to more posts. Love, Esi. Anyway…thank you so much for reading. I almost didn’t post this one. Now, I’m really glad I did. I understand the frustration at times. I told Ryan just the other day, “Trying to get to God (or feel connected to him) feels like swimming through cement right now.” Ha! Kind of extreme, but you get my point. Keep on keepin’ on, as they say…Like you said, He hand is SO over you. You are one mighty woman, Esi Barnum. This verse really stood out to me today. I have also felt far from God and I so admire your honesty. I know it is much easier to share our past trials more than our current ones. I ask God to do His perfect will in your life through this struggle and that you will trust Him in your waiting; that you will continue to cry out to Him. I have a feeling that this time is meant to make you more holy and more in step with the Spirit and you will be grateful because of it. You are sooooo real and so awesome! Thanks again for sharing your heart! And fully agree with Terry…..you will have another tool under your belt to relate, to share and to bless to other in similar situations. YES!! HE is Faithful, Patience, and Kind……Love your song….truly miss your singing. I already sent you a message back on FB but thank you again, Elaine!! Hi Brittany!! This song and your voice are just amazing, God has truly blessed you with such a wonderful gift. And the way you touch people’s hearts is what is most important. I have certainly felt far from God and know the pain and sadness of this, but reminding myself of all His goodness in my life and scriptures has brought me through. Looking soooooo forward to hearing more songs and your beautiful voice in the future!!! Love ya! !